I feel very fortunate to be a plumber in 2013. Any time I’m having a hard day or am frustrated with a certain job, my dad will tell me a story about how he had to do that same job 35 years ago. It would usually go something like, “I never had a helper, so I would strap a 500 lb. cast iron tub on my back like a turtle and lug it up the stairs,” or “We didn’t have propane torches back then, so we would use a magnifying glass and the sun to heat up the joint.” The hope was for the Ridgid 238-P powered soil pipe cutter to change all that. My first experience with cast iron snap cutters was back in 1971 in trade school using the old long handle squeeze type. You had to jump up in the air, push the handle to the ground, and then watch both ends fly apart (hoping no one was in the way). Sometimes the pipe didn’t cut, and you’d have to do it all over again. No one was happier than me when plastic pipe started to catch on for drain lines, especially since I was still using lead and oakum to fill the joints. Even after I graduated, there were jobs where code required cast iron, so I bought a ratchet-style cutter. After that one wore out, I bought another one that was much easier to use and required less force to cut the pipe. The old soil pipe cutters were really heavy, especially when you had to hold them over your head and get them tight to the pipe. Most times, they were awkward in tight places where you needed to remove a section of pipe in the wall that needed to be replaced. That ratchet-style cutter is still the one we use at Sturm Plumbing today. It fits well alongside tools like the Ridgid Close Quarters ASTM F1807 PEX Crimpers. It’s amazing, when you buy good tools, just how long those tools can last. When the Ridgid 238-P Powered Soil Pipe Cutter arrived in the mail, my dad actually laughed when he saw it. It was less than half the size of the one we have and weighed less than 15 lbs. My dad thought for sure this was not going to outperform “the beast” we had been using over the years. I, however, was not as skeptical because I noticed a trend over the last decade: everything seems to be getting smaller, and still somehow more powerful. Things like cell phones, memory cards, tools, electronics­—you name it, and most likely it has gotten progressively smaller since 2000. We didn’t want to judge this book by its cover, so we tested the 238-P to see how it compared to our trusty ratchet cutter, a.k.a. “The Beast”. We decided to use a 3” piece of ductile iron for our test cut. Ductile iron is a thicker and more durable type of drain pipe used especially for liquids that tend to be more corrosive. The walls of this test piece were over 5/8” thick, so even though it was only 3” pipe, it would still put the 238-P to the test. The first thing I noticed about this tool is that it’s simple to use. I like simple. Ridgid provides you with the ratchet cutter and a nice 1/2” square driver bar with plenty of length for leverage. The Ridgid 238-P powered soil pipe cutter is called as much because you can manually cut the pipe with the provided ratchet extension, or you can use your own powered impact wrench. If you plan to use an impact wrench, make sure the foot-pounds are in the range of 200-400. Anything less than 200 will not cut the pipe, and if it’s over 400, you can risk damaging the tool. At that level of power, you’re pretty much looking at an 18V or higher tool if you want to go cordless. Most 18V impact wrenches, we use a Milwaukee M18 FUEL impact wrench, have the required torque, whereas hex-bit impact drivers top out at around 125 ft-lbs. The Ridgid 238-P allows a 1/2” square drive bit to fit nicely into the back of the ratcheting mechanism for easy cutting. Since we were just testing the tool, we were able to place the pipe on stands and cut in an open area, which is rarely the case on the job. We do a lot of residential work, and typically we would use this tool to cut out a section of damaged pipe on the main stack in a house. Most of the time, they run the pipe down the wall without leaving much room to get a tool behind it. This is where the compact design of the Ridgid 238-P pays off. Not only is it lighter than most tools (13.5 lbs), but the low profile cutter wheels really help when the stack is close to a wall. The Ridgid 238-P powered soil pipe cutter works like most other ratchet cutters. The first step is to loosen the adjusting knob all the way and attach the chain around the pipe. One feature I noticed (and liked) right away was the ring at the end of the chain to help maneuver it into place. Once you have the chain in position, you’ll want to put the chain pins into the hooks as tightly as you can. If you don’t do this, there’s the possibility that it may not have enough travel to cut the pipe. After it’s hooked in, you can manually turn the adjusting knob until it’s snug. I really like the design of the adjusting knob. It’s nice and big, so you can turn it very easily, and it spins smoothly. The one thing I didn’t like is that even after you snug up the chain, it still may not be perfectly straight to the pipe. I feel like they could have added some sort of flat roller system that automatically straightens the chain out once it gets tight. Once you get the chain snug by hand, you can spin the tool around in either direction a few times to score the pipe and get a smoother cut. 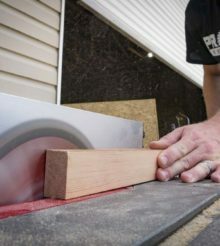 I didn’t score the pipe in our initial test because I wanted to first see how the tool cut without performing this step. All in all, it cut pretty smoothly considering the thickness of this material. My biggest concern with this tool was how it reacted once the pipe was cut. We talked earlier about how violent it can be once the pipe finally breaks apart on other cutters. I wondered if the chain would go flying one way and the pipe the other, but I was surprised at how quiet and docile it was once the cutter broke through. The chain didn’t flip around, and nobody lost a limb—that’s always a good thing. If you are manually cutting with the ratchet, they provide two points for leverage. There is a removable handle on the Ridgid 238-P that can be placed on either side as well as a multipoint section that allows you to grip it with a crescent wrench. I found the removable handle a bit awkward to use when cutting the pipe on stands. Even though I strapped the pipe down, it still had the tendency to twist while I was torquing it. In this type of application, I preferred to use the crescent wrench to get better leverage and a more stable grip. Still, the nicest feature by far is the ability to attach your own impact wrench. It makes cutting a lot faster and safer since you have a free hand to catch the pipe or tool once it breaks through. The Ridgid 238-P is able to cut cast iron (up to 8”), concrete (4–6”) and terracotta pipe (up to 8”). If you are using the provided ratchet, the biggest size you can cut is four inches. Anything over four inches will require you to utilize an impact wrench. One thing I wish Ridgid had provided was a basic storage container (see item #4 in our article “Seven Deadly Sins in Tool Repair & How to Avoid Them”.). From experience, we know that our other cutter gets banged up considerably, lugging it around from job site to job site. Even though it feels heavy duty, dragging this tool in and out of your truck can dull the cutting wheels over time, so I recommend keeping it in some sort of case. Impact driver operation: 200 ft-lbs. min. It appears there aren’t many new features on the latest soil pipe cutter by Ridgid, and to be honest I don’t think there needs to be. This is one of those tools that does its job consistently, and as I said earlier—it’s simple. Instead of trying to make this tool fancier, Ridgid decided to make it smaller. In my professional opinion, that’s better. I would much rather have a tool that fits into tight places than one I can never use because it’s too big. As long as it does its job, I don’t mind when things get compact and lighter. I may not have paid my dues like the older generation of plumbers, but I think a lot of them would agree with me. I’m happy to say I’ve never had to lug a cast iron tub upstairs by myself, and hopefully you’ll never have to resort to a magnifying glass to solder a pipe! Joshua works with his father and brother at Sturm Plumbing ("The Faucet Doctor")—a family-owned, plumbing sales and service business in the small town of Harrison City, Pennsylvania. With over 40 years experience as master plumbers, Sturm Plumbing has helped customers from across the country with hard-to-find parts. Their plumbing expertise has landed them articles and awards in Fine Homebuilding, Plumbing & Mechanical Magazine, The New York Times and The Bob Vila Show. Oh, he also happens to be married to the talented and beautiful singer-songwriter, Lacey Sturm.